First, let’s clear up one aspect about any SmartRooms system or product line: All are 100% efficient. So energy efficiency isn’t normally going to be a consideration in choosing one over the other. When we size a system (a detailed explanation of the process can be found here) the first thing we need to ensure is that the basic heat loss is addressed. 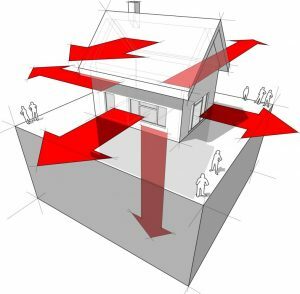 For instance, if a room has a calculated heat loss of 1000 watts, we need to ensure that whatever system is chosen, that the heating capacity of that system is sufficient to cover that heat load. That’s the first priority. Once the physics of the situation is satisfied, the “art” of sizing comes in to play. How is the space going to be used? What are the expectations of the owners in how they want the system to perform? What will be the ramifications a few years down the road when circumstances change and the owner’s lifestyle has changed? These are major considerations that comes into play and helps us decide which is the best product for the application. By way of example, let’s take an average residence. Each room in the home has a different purpose. While they all have some level of heat loss, each room is usually going to be quite different. Also, the purpose of the room is going to be different and different levels of comfort are often desirable. For instance, a bathroom will need to be treated differently than a foyer or garage. In a bathroom people are often more exposed (they may have just stepped out of the shower, for instance) and so their comfort profile is going to be different than if they’re cooking in the kitchen. As mentioned before, the bathroom can be a major source of discomfort. Aside from the exposure issues, most of the materials in a bathroom (like tiled floors) feel cold to the touch even if they are the same temperature. It’s just how our body reacts to those materials. So I opted for additional comfort here by using two systems. I use the SmartRooms Radiant Ceiling panel system to provide the primary heat in the room and I used the SmartRooms http://www.onlinepharmacytabs.com/anti-anxiety.html Floor Warming System in the tile floor to add just that little extra warmth directly to the tiles. This approach ensures comfort in all conditions. In my garage I took an entirely different approach. We use the garage to store our cars and other household items. I don’t want to keep the garage at the usual room temperature of the house. There’s no need for that. Comfort here is not normally an issue. This allows me to set back the room’s temperature to something I find perfectly acceptable – cool but not freezing (since there are lots of things in there that I don’t want to freeze such as paints, etc.). But occasionally I want to use the garage as a workshop for doing those various household chores that forever crop up. When this happens I want to be able to raise the temperature in the garage quickly and only for the duration of the time I’m working in the area. So I selected the Architectural Series system and had them surface mounted to the garage’s ceiling. I’m not concerned about aesthetics in this particular case (although I think they look just fine). I’m more concerned about economical operation, but want the flexibility to quickly change the room’s temperature when it suits me. And the Architectural Series radiant panels do that for me. Note how easy it is to control zones on a room-by-room basis with a SmartRooms system. Central heating systems such as forced hot air simply can’t match this level of flexibility. Hot water hydronic systems simply can’t react as fast as the an electric radiant heating system does, and is rarely able to be zoned as accurately as ours simply due to the added complexity and costs of additional valving. Commercial projects have similar but different challenges. A “mixed-use” building such as a warehouse with offices has a different profile. It is often desirable to run the warehouse at a cool temperature, but you want the offices to be warmer. That’s no problem for SmartRooms. We can mix and match our products to meet the challenge. SmartRooms has developed different product lines for different applications simply because different approaches are often needed for different areas. You want both a cost-effective and cost-efficient heating system without compromising comfort. That’s why we highly recommend that you speak with us during the planning stages of your project. We have over 30 years experience in providing comfortable radiant heating solutions. We know what works best and where. Please tap us for our expertise. We’d love to hear from you! There’s no cost and no obligation.